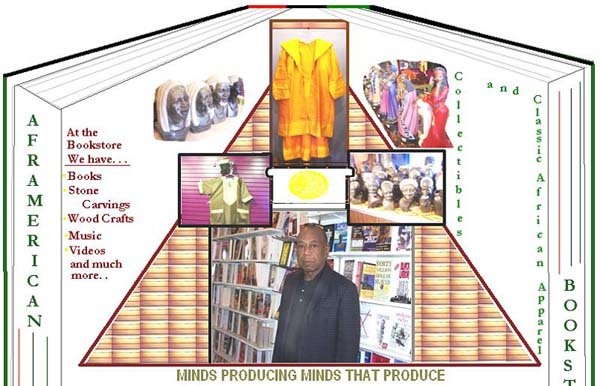 Aframerican Bookstore is a wholly owned independent African-American enterprise established in 1990. We can help you discover works by emerging authors as well as older favorites. Check with us for books written from African centered perspectives. The purpose of this website is to promote the distribution of literary works that are uplifting to the spirit and to the community. In particular, this website is committed to the distribution of a book of poetry titled THE BLACK PANTHER IS AN AFRICAN CAT by Wopashitwe Mondo Eyen we Langa [formerly, David Rice]. The book was published in February, 2006 by House of August Press in Van Nuys, California USA and is distributed by Aframerican Bookstore. THE BLACK PANTHER IS AN AFRICAN CAT is a powerful collection of revolutionary poems, raps and pictorial assemblages by the leading author of the genre. Mondo's status as a political prisoner since 1970 and a community activist involved in the struggle for freedom and justice, provides him with a unique perspective on the African American experience in America. Mondo is an accomplished author, essayist, playwright, artist and sculptor. Aframerican Bookstore is located at 3226 Lake Street in Omaha, Nebraska USA and may be reached at 402-455-9200. The website provides the visitor with the opportunity to purchase books on-line using PayPal to order using a credit card or a PayPal account, as well as the option of using an order form that may be printed out and mailed. You do not need to have a PayPal account to order books using this website.